The US government is alone among developed countries in granting the much-desired “organic” label to hydroponic growers. Hydroponic pro-duction is a soil-less process that has long been the norm in conventional greenhouse production. Now it is fast becoming the norm in U. S. organic certification for several major crops, such as tomatoes and berries. Hydro plants are fed via fertilized irrigation water. Experts say the explosive growth in hydroponic imports may force some organic farmers out of business in as little as five years. Vermonter Dave Chapman, an organic tomato farmer who served on the USDA Hydroponic Task Force, told the crowd that the hydroponic incursion has become an “invasion,” as more and more hydroponic producers from around the world discover that they can now gain access to America’s coveted organic market. 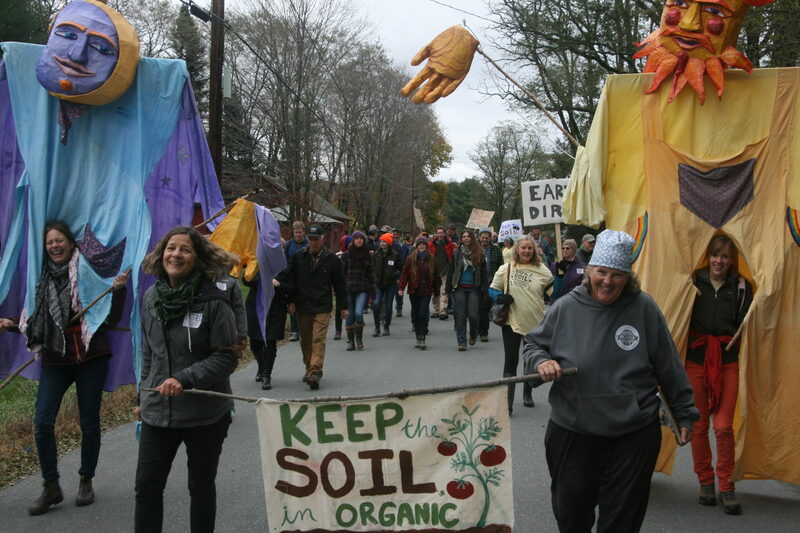 The marchers led by Enid Wonnacott, Executive Director of NOFA VT and organic farmer Kate Duesterberg of Cedar Circle Farm. Men and women farmers, many wearing hand-knitted wool hats and work gloves against the chilly weather, came from as far away as Maine, Pennsylva-nia, and New York. 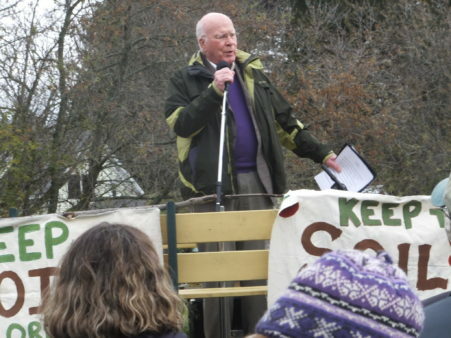 The Rally in the Valley began at noon Sunday with a 26-tractor cavalcade that started at Long Wind Farm in East Thetford, VT, and rolled slowly to nearby Cedar Circle Farm. “Keep the Soil in Organic” and “Take Back Organic” were among the hand-made signs that marchers carried as they sang to onlookers. Twelve-foot-tall puppets made by Vermont’s Bread and Puppet Circus, depicting the sun and the moon, led the way. Most hydroponic production facilities in the U.S. were started after the 2010 recommendation from the National Organic Standards Board (the advisory board to the USDA) that called for excluding all hydroponics from the organic label. And yet, since that 2010 recommendation, the USDA has welcomed all hydroponic production into the organic certification program, going so far as to issue a clarifying statement in 2014 that hydroponic production qualifies as organic if the companies use “permitted” fertilizers. On November 16, the National Organic Standards Board will once again consider a proposal to prohibit organic certification to hydroponic producers. The hydroponics industry is attempting to prevent the proposal from coming to a vote of the full Board. Whichever way the Board votes, it is likely that it will be a long struggle before the USDA will actually prohibit hydroponics.